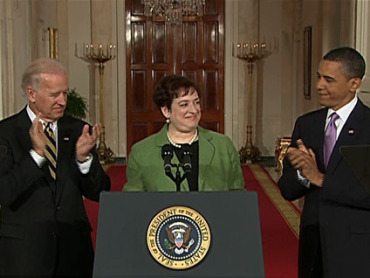 President Barack Obama's Supreme Court nominee Elena Kagan has a history of association with people tied to three interrelated organizations, the Communist Party USA, Democratic Socialist Organizing Committee/Democratic Socialists of America and the far left Washington DC "think tank" Institute for Policy Studies. My last post looked at the radicals Kagan associated with during her college years at Princeton. This post looks at two of Elena Kagan's employers post college, Congressman/Judge/White House official Abner Mikva and Supreme Court Justice Thurgood Marshall. From 1986 to 1987 Elena Kagan worked as a Judicial Clerk for , Hon. Abner Mikva in the U.S. Court of Appeals for the D.C. Circuit. Usually regarded as a "liberal' or "progressive", Mikva in fact has a long history with the far left, in both Washington DC and his Chicago base. Abner Mikva worked with Communist Party supporters like Elias Snitzer and Sid Socolar, during his time at the University of Chicago Law School in the late 1940s. From 1947 Mikva practiced labor law in Chicago in partnership with with Arthur Goldberg, general counsel for the communist dominated Congress of Industrial Organizations and the United Steelworkers of America. 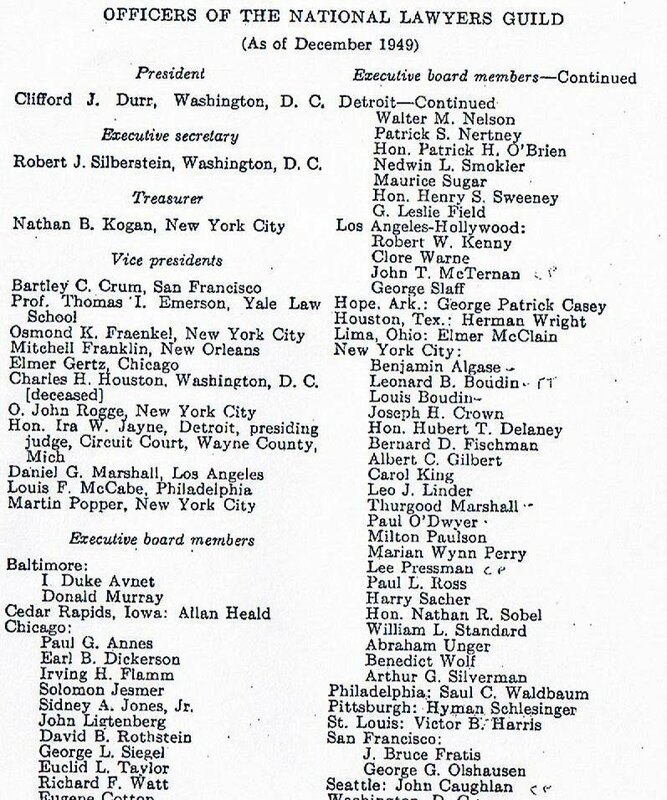 Arthur Goldberg sponsored several Communist Party fronts in Chicago . These included the Chicago Conference on Race Relations, the Conference on Constitutional Liberties in America and the National Emergency Conference. Goldberg was also president of the Chicago chapter of the National Lawyers Guild, accurately cited by Congressional investigators as "the foremost legal bulwark of the Communist Party". Arthur Goldberg was later appointed to the Supreme Court by President Lyndon Johnson. In the 1950s Mikva and his wife Zoe Mikva, both worked with another communist infiltrated organization, the American Civil Liberties Union. In the 1960s when first standing for Congress in South Chicago, Mikva worked closely with radical community organizer Saul Alinsky, a man to whom, President Obama owes a considerable intellectual debt. Mikva also worked closely with two radical journalists who ran the Hyde Park - Kenwood Voices newspaper. Don Rose and his partner, Communist Party member David S. Canter would become key Chicago power brokers. One who they personally mentored and promoted was a young journalist named David Axelrod - later Barack Obama's key campaign strategist and now senior White House adviser. In April 1975, the Communist Party controlled Chicago Peace Council convened a "National conference for a drastic cutback in military spending" in the "Windy City"
The purpose of the National Conference is to mount a national campaign and a vigorous program of action which will speak to the hundreds of thousands who were part of the inspiring resistance to the war in Indo- China. The people of the U.S. can and must turn this country around. Speakers at the Conference included Congressman Abner Mikva, Richard Criley and Norman Roth, both members of the Communist Party and leaders of the very successful Party front group, Chicago Committee to Defend the Bill of Rights. Ed Sadlowski, of the United Steelworkers and later identified as a member of Democratic Socialists of America, also spoke..
During the 1980s. Mikva was very close to the Institute for Policy Studies in Washington DC- a place where leftist Democrats and the occasional "liberal" Republican, mingled with socialists, communists, third world revolutionaries and East Bloc "diplomats". 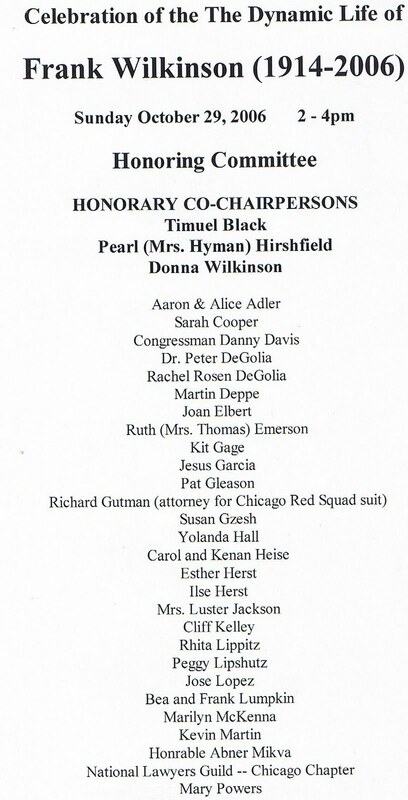 Abner Mikva attended the organization's 20th anniversary celebrations on April 5, 1983 - he was obligated really, as his wife Zoe personally organized the affair. Abner Mikva, was one of Barack Obama's early admirers, beginning in 1990 when he tried to hire the first Black president of the Harvard Law Review, for a clerkship. Obama turned Mikva down, saying he was going to move to Chicago and run for public office. Mikva was later close to both Barack Obama and Elena Kagan at the Chicago Law School where they all taught during the mid 1990s. 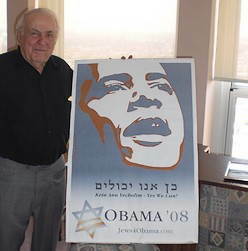 Mikva acted as a mentor to Obama during his early political career. Through all this, Abner and Zoe Mikva never forgot their Chicago communist and socialist friends. 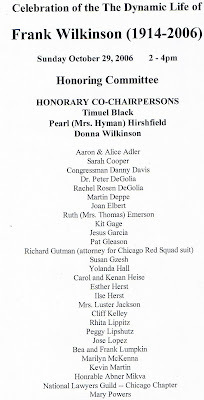 "Ab & Zoe Mikva" sent the message ""Hooray for Progressives" to the Chicago Democratic Socialists of America 44th Annual Eugene V. Debs - Norman Thomas - Michael Harrington Dinner, May 10, 2002. In 2006 Abner Mikva served on a committee to honor the life of Chicago Committee to Defend the Bill of Rights founder, Frank Wilkinson, a forty year Communist Party veteran turned Democratic Socialists of America comrade. Serving on the Committee (though not all pictured below) with Mikva were Obama friends , mentors and D.S.A. members Quentin Young, Timuel Black and Congressman Danny Davis, plus current or former Communist Party supporters Joan Elbert, Ruth Emerson, Yolanda Hall, Peggy Lipschutz, Bea Lumpkin, Frank Lumpkin, Harold Rogers, Norman Roth, Emile Schepers and Tim Yeager. The National Lawyers Guild - Chicago chapter, was also represented. In 1987 - 1988 Elena Kagan worked as a Judicial Clerk for Hon. Thurgood Marshall in the U.S. Supreme Court. Though sometimes mistakenly identified as an anti - communist, Thurgood Marshall, had a radical past. At the all Black, Lincoln University in Chester County, Pennsylvania in the 1930s, Marshall's classmates included future socialist President of Ghana, Kwame Nkrumah and poet and author Langston Hughes, later a close associate and fellow Communist Party comrade of Barack Obama's teenage mentor Frank Marshall Davis. In 1946, according to communist linked historian Herbert Shapiro, Marshall was saved from a probable lynching near Columbia Tennessee , by a passenger in his car - Communist Party journalist Harry Raymond. 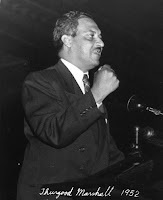 In the late 1940's Thurgood Marshall was active in the leadership of at least two Communist Party infiltrated organizations, the American Civil Liberties Union and the National Lawyers Guild - in which he served on the National Executive, representing New York. Other New York members of the N.L.G. 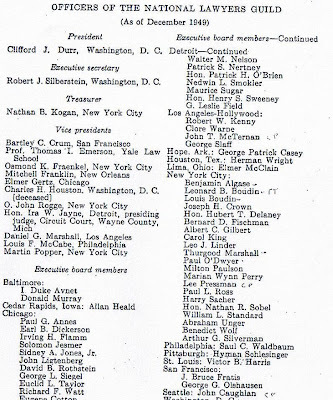 National Executive in 1949, included Communist Party members Leonard Boudin, Lee Pressman, Henry (Harry) Sacher and Abraham Unger. Lee Pressman was a fully fledged Soviet spy, a member of the famous Ware Group which had operated inside the U.S. government, before and during WW2. Leonard Boudin's daughter Kathie Boudin, studied at Moscow University in 1966, before becaming a leader of the terrorist Weather Underground Organization, with Bill Ayers and Bernardine Dorhn. After Boudin was jailed for her part in a botched 1981 robbery, which left three men dead, her son Chesa Boudin was raised by Ayers and Dohrn. It is likely that Barack Obama would have met Chesa Boudin through his friendship with Ayers and and Dohrn. In 1959, Kenyan independence activist and labor unionist Tom Mboya visited the U.S. and met Thurgood Marshall. Mboya was so impressed with Marshall that he invited him to Kenya to help draft a new constitution for independent Kenya. Marshall visited Kenya in 1960 on Mboya's invitation to attend a conference. His visit however didn't impress the British and the Americans authorities, who considered him a radical. Under pressure from the British, the Kenyans barred Marshall from attending the conference. However, it is Marshall's friendship with Mboya that is credited with a wave of Kenyan students coming to the U.S. for further studies, beginning in the 1960s. One of these, a Marxist economist named Barak Obama, studied in Hawaii, where he met 18 year old Stanley Ann Dunham, with whom he fathered a future president of the United States. In 1965 President Lyndon Johnson appointed Judge Thurgood Marshall to the office of U.S. Solicitor General. He was nomination to the United States Supreme Court in 1967. Elena Kagan spent her youth in New York and Princeton mixing with people linked to the Communist Party, Democratic Socialist Organizing Committee/Democratic Socialists of America and the Institute for Policy Studies. Elena Kagan's first two employers, Abner Mikva and Thurgood Marshall also had similar connections. Now Kagan has been nominated to the Supreme Court by a President with similar affiliations. I reprinted the article on my blog. We bloggers are like an army of ants attacking an elephant - each tiny bite is not fatal to the huge creature, but millions of bites are deadly. They craft their schemes in the shadows of these Communistic safe havens like Chicago. Sunlight is the best disinfectant, but if the media continues to provide the shade for these cockroaches to operate in, is there any way to stop them from breeding? fiddystorms, They don't much care for the light of Truth. When they aren't amongst their own, they lie and obfuscate and pretend they are other than they are. WHY? Because something deep inside of them KNOWS that there is inherent -- even in the most "compassionate" aspects of Communism -- an evil that cannot be erased. We must find a way to take back our schools from them, take back our media from them, reverse the damage done by Progressive/Communist propaganda in almost everything we read and see these past umpteen years. And we must keep them in the light -- we must not give them the shelter of darkness. We should broadcast the words from Witness -- Whittaker Chambers incredible memoir and precise analysis of Communism. Amazing research! When you connect these dots, they form the hammer and sickle..... We must stop this from replacing the stars and stripes!!! Remember the courage of our Founding Fathers on July 4, 1776, and pledge our efforts to the preservation of our Freedom. I am so glad to find your site. It helps to know that not everyone in the world has gone insane! Thank you for what you do and all your research. Let freedom reign! As an American, I am very grateful for this site and information given here. Not one of our American reporters are capable or have the desire to inform the citizens of our Republic about the evil in our White House. Elena Kagan is not fit to be a Supreme Court Judge - she is a traitor to the Constitution and will not judge according to its precepts. Like BO she is a communist. Keep folding tinfoil hats, you're going to need a good supply. Why are people so ignorant of what's really going on around them? Vote those out who would take away the American way of life which has been so good to so many, including those who now want to destroy this country. What other country in the world has given so much to so many? And do you know why America has been blessed with so much wealth? Because this Country was founded upon the Judeo/Christain faith. That is the truth and one of these days, God Almighty will bring down all of those who have been complicit in taking God out of our country. There will be a day of reckoning. Glad I'm secure in Jesus Christ who died for my sins. Let's take back this country by putting God back in our lives.